Sony NWZ-A15 review | What Hi-Fi? High resolution is the audio fledgling that hasn’t quite found its momentum yet. One of its obstacles is the prohibitive price of music and equipment, so we’re pleased to see Sony bring its latest Walkman out at the lower end of the market. The Sony NWZ-A15 is an entry-level music player, offering high-res goodness for £170. While it cannot match premium rivals on performance and build, it’s a good place to start your resolution revolution. For the money, we don’t expect too much, and the NWZ-A15 is a suitably dedicated device. That means no wi-fi, and no apps. Fancy some Spotify streaming or Miracast/DLNA action? You’re in the wrong neighbourhood. Near-field communication (NFC), FM radio and aptX Bluetooth is about as fancy as the features list gets. The screen – 2.2in, 320x240 pixels – only functions as a display and offers no touch capability. You control the Walkman using physical buttons – remember those? A diamond-shaped directional pad adorns the front, with enter/play/pause at its centre. The ‘back’ and ‘option’ keys try their best to hide at the bottom of the screen. The right side has volume keys and a ‘lock’ slider to stop you from accidentally hitting play with your buttocks. The bottom edge has a 3.5mm headphone socket, and a proprietary port for data and USB charging. There’s also a tiny loop in case you want to swing your shiny new device on a lanyard. The design is a matter of function over form, and certainly won’t have Jony Ive trembling in his ergonomic boots. The textured aluminium face makes a good first impression, but a closer look and a quick feel leads to disappointment. The matte finish on the back and sides looks and feels a little cheap. The exposed screws don’t help, nor do the straight lines and odd angles of the case. 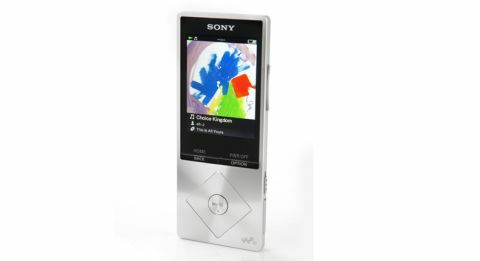 We find ourselves missing the luxury of the Sony NWZ-ZX1 and the simplicity of the Sony NWZ-F886. At least it’s tiny. Booting up is a speedy experience, taking no more than a second - no loading screens and spinning logos here. What greets you is a very basic menu leading you to content and settings. Loading music onto the Walkman is a matter of dragging and dropping files from your computer. The internal 16GB fills up quickly, but you can insert a microSD card. Sony tells us the device was designed with 64GB cards in mind and ours was accepted without question. File compatibility includes MP3, WAV, AIFF, WMA, AAC, HE-AAC, FLAC and ALAC. This Walkman is not capable of decoding DSD files, however. Finding your content from the main menu is easy enough, although the ‘Back’ key provides an easy escape if you do take a wrong turn. It feels a little archaic, especially after being spoiled by lovely touchscreens. In the music playback screen, the options menu gives you many ways to play with the sound. At the most basic level, there are standard EQ settings. There’s also the ‘ClearAudio+’ option, a rather decent automatic EQ that widens the stereo image and dynamics a little. There are also some bizarre offerings, limited to non-high-res tracks. ‘Dance Mode’ lets you raise and lower the tempo to suit your optimal boogie speed. ‘Karaoke Mode’ cuts down the vocals of non-high-res tracks to let you slaughter your favourite tunes. We recommend tinkering with EQ settings, but we’re happy with the default sound. We’re impressed by the audio performance of this diminutive device. We start jamming with Bob Marley’s Could You Be Loved and it’s an insightful listen. The Walkman shows all manner of texture, from the obvious drumming and guitar picking to the subtle cuíca sound. Tonal balance is good, with no undue emphasis on any part of the frequency range. It’s a lean sound, which helps with agility, but it never oversteps into thinness. Our recent experience with Sony portables has led us to expect regimented precision, but the A15 doesn’t quite tick that box. Instruments are well organised and clearly positioned within an accurate soundstage, but timing isn’t as taut as we’d like. There’s also the issue of dynamics, which we’d like to be more expressive. The agile, energetic character shows the A15 to be cut from the same cloth as the Sony NWZ-F886, but this pricier sibling is better in nearly every way: with greater detail, dynamics, refinement and scale. Then there’s the matter of features: the higher-end models offer a wealth of Android-based, web-enabled features. Ultimately it comes down to this: if you want the very best in sound quality and features, the A15 isn’t what you’re looking for. But if you’re not after flashy features and merely want to dip your toe into the high-resolution water, this is a very good place to start.